Call for expressions of interest from artists for the Research and Development phase for a Public Art Programme for the new Children’s Hospital. 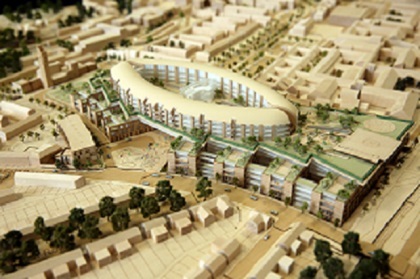 The new children’s hospital to be built on the grounds of St James’s Hospital is the most ambitious healthcare development in the island of Ireland in terms of scale, design and clinical care. Designed by BDP and O’Connell Mahon Architects, this iconic building will be a world class facility that will look after children and young people from all over Ireland who have complicated and serious illnesses and who are in need of specialist and complex care. In addition to the hospital, two Paediatric Outpatient and Urgent Care Centre’s will be built at Connolly Hospital in Blanchardstown and Tallaght Hospital to open in 2018 and 2019 respectively. The project will bring together three existing children’s hospitals: Our Lady’s Children’s Hospital Crumlin, Temple Street Children’s University Hospital and the National Children’s Hospital at Tallaght Hospital. The Children’s Hospital Group (CHG) invites Expressions of Interest from experienced artists to enter into a phase of Research and Development between August and October 2017 leading to proposals for a range of ambitious artworks that will be integrated into the new children’s hospital public realm spaces and its Paediatric Outpatient and Urgent Care Centres. This Research and Development Phase will be a stand-alone contract and the realisation of resulting proposals will be contracted separately. This entry was posted on June 9, 2017 by waterfordarts in Art, Arts Office Projects, Arts Opportunity, crafts, Demonstration, Drawing, events, Exhibition, Workshop/Up-skill and tagged art, Arts Grants, waterfordarts.com, whats on waterford.